Ethereum plunged as much as 17% Monday, sinking to a low of $US285.14 per token, it’s lowest price since September 2017. Ethereum is closely intertwined with initial coin offerings (ICOs). Over the past year,those thousands of fundraisers propped up the price of ethereum.Monday’s decline comes as many of those projects cash out of the blockchain in order to fund their operations, one expert told Bloomberg. 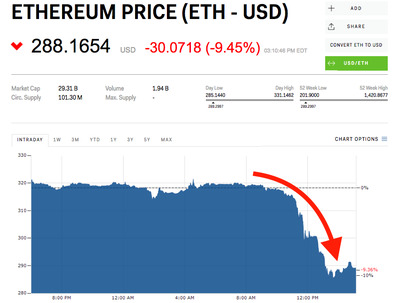 The price of ethereum, still the second-largest cryptocurrency by market capitalisation, is now down more than 61% this year.